Illustration from the hardback second edition of "The Eagle of the Ninth." 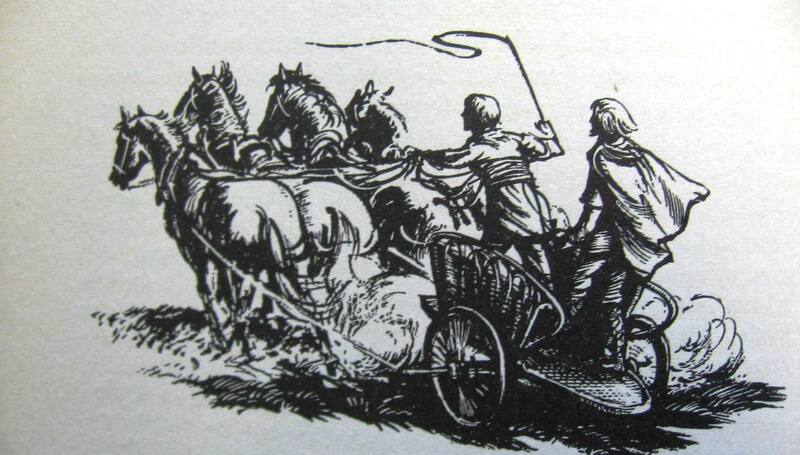 “[Marcus] took the team through every trick and test that their master ordered, until the moment came for a final burst of speed, and they were sweeping at full gallop round the mile-wide curve of the woodshore. To Marcus that moment was always like being born from one kind of life into another. So must an arrow feel when it leaves the bow! It had been hot and sultry in the old life, but in this one the cool wind flowed against him like water, pressing his thin scarlet tunic into his body, singing past his ears above the soft thunder of the ponies’ flying hooves. He crouched lower, feeling the chariot floor buoyant and vibrating under his wide-set feet, feeling the reins quick with life in his hands, his will flowing out along them to the flying team, and their response flowing back to him, so that they were one. He called to them in the Celtic tongue, urging them on.